This fully 3D-printed clock is probably unlike any other digital clock you have seen. While in a regular LCD or LED-based digital clock the 7 segments for each of the four digits are switched on and off, the segments of this clock physically pivot in and out of view with the help of 28 individually controlled servo motors. The servos are connected to an array of servo controllers operated by a Raspberry PI application. This huge clock (23" x 8") is sure to be an attention grabber and a great conversation piece in a crowd of computer and robotics nerds. And it shows precise time too! 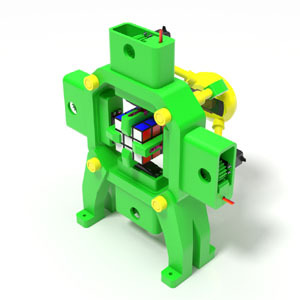 This Rubik's Cube solving robot is fully 3D-printed. Other than the servos, servo horns, electronics and a few dozen bolts and nuts, it does not have a single traditionally manufactured part. If you have a 3D printer, less than $200 to spare, and some patience, this smart and beautiful machine can be adorning your own desk for everyone's enjoyment. This robot has everything any serious robot does -- arms, servos, gears, vision, artificial intelligence and a task to complete. If you want to introduce robotics to your kids or your students, this is the perfect machine for it. This tank does not require a single bolt or nut. You just print the parts, put them together, connect the motors and electronics, and it is ready for battle. It shows excellent off-road capabilities, and turns on a dime. Each of this tank's two tracks is printed in a single piece, thus eliminating the need for assembly hardware. The machine shown here is powered with a Picaxe 20M2 microcontroller installed on a 300-hole mini-breadboard. There is also an H-bridge motor driver, an IR sensor, a couple of resistors and capacitors, and a whole bunch of jump cables. The entire set of electronic components used here can be bought on eBay for just a few dollars. The tank is operated with a regular Sony TV remote control. Every automobile's got one, and this motorized model gives you a sneak peek of what's inside that large round housing where the drive shaft and the two wheel shafts meet. The automotive differential transmits power from the engine to the driving wheels while allowing them to rotate at different speeds. 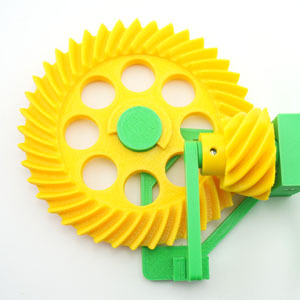 There are four bevel gears in the center of a differential, and the pinion and ring gears (shown here in yellow) are usually of the bevel kind too, but this particular model uses a hypoid gear pair instead. The model is powered by a 6V electric motor equipped with a speed reducer. 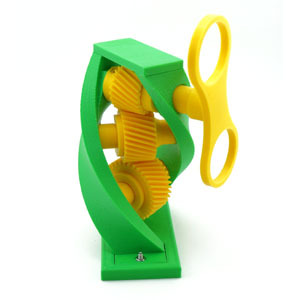 This mechanism, through the clever use of planetary gearing, converts simple rotation to a walking motion. The Walking Gear Bot is driven by a single electric motor powered by four AA batteries. 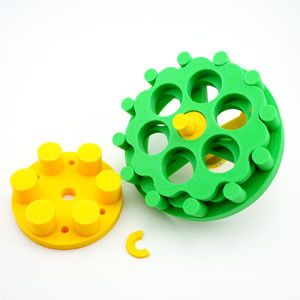 This robot is built around 11 meshing involute gears, and there are 36 printable parts overall. 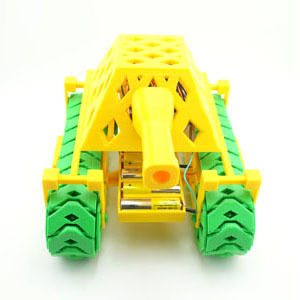 The Walking Gear Bot is an all-around fun and educational mechanical toy enjoyable by adults and kids alike. Most gearing mechanisms known today were invented decades or even centuries ago. Not so with the Eccentrically Cycloidal (EC) drive: it is so new the ink is still not dry on its patents! This 3D-printable model is made available to the public with the explicit permission of the patent holder. Print your own EC model and become one of a very few human beings to ever lay hands on this new and remarkable invention. This futuristically looking mechanism is very efficient and extremely compact. The gear ratio in this particular EC drive model is 1:9, an almost impossible feat for a standard involute gear pair. Hypoid gears are similar to bevel gears but the pinion and wheel in a hypoid pair have non-intersecting axes. 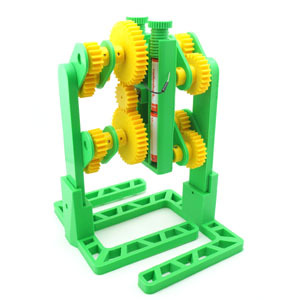 Unlike our bevel gear model, where the gears are overhang-mounted, the pinion in this model is straddle-mounted (i.e sandwiched between two bearings) for a much sturdier assembly. Click here to see the video of this model in action, and download the .stl files. The hypocycloid speed reducer is truly an amazing invention. 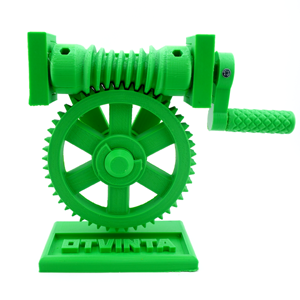 We have designed a 3D-printable model of the hypocycloid drive in such a way that you can actually see the inner workings of this remarkable mechanism. 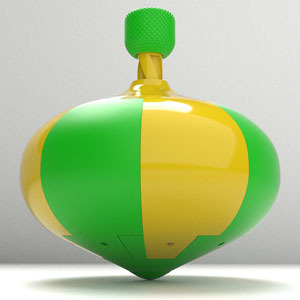 Click here to see the video of this model in action, and download the .stl files. 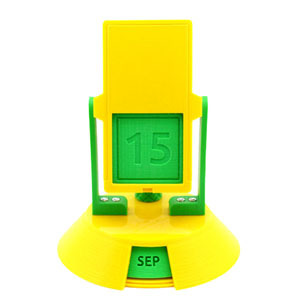 Inspired by vintage flip calendars of the 60s, this 3D-printed "perpetual" desktop calendar needs no batteries. You flip it every day to advance the date	and gravity does the rest. Click here to see the video of this calendar in action, and download the .stl files. 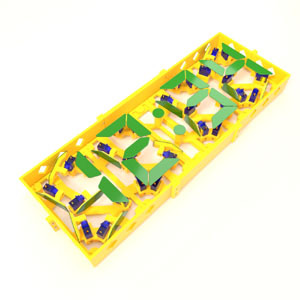 This stackable model allows for an unlimited number of stages. Even with 3 stages shown here, this planetary gear reducer packs an impressive 1:216 gear ratio. 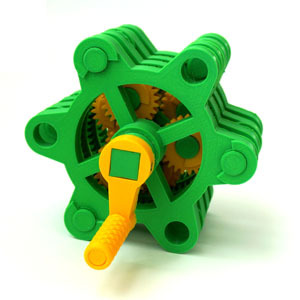 Designing planetary gears in Blender 3D is described in detail in our Tutorial #04. 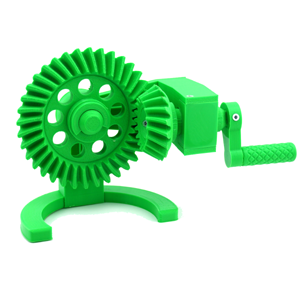 Add this functional bevel gear drive model to your collection of 3D-printable mechanisms! The model features bevel gears with involute tooth profiles, curved teeth and a non-right angle between the shafts. Designing bevel gears in Blender 3D is described in detail in our Tutorial #03. Nothing validates a mechanical design better than a functioning, physical model! 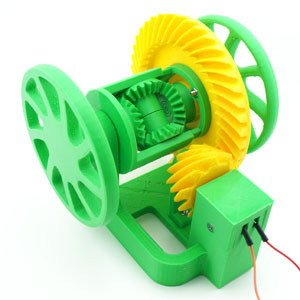 The globoid gear drive, the subject of Tutorial #02, is now available as a collection of 3D-printable parts in STL format that assemble into a perfectly operational and aesthetically appealing hand-cranked desktop mechanism. 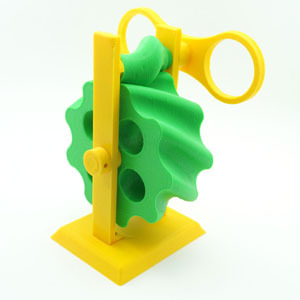 The model makes a great conversation piece, and a fun and educational toy for your kids!